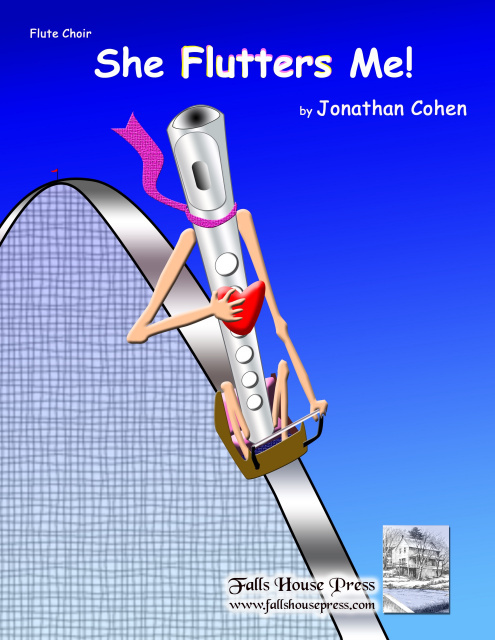 Home / Products / Cohen, Jonathan – She Flutters Me! for flute choir. Here are adrenaline-filled impressions of new love: incandescent glances, scintillating touches, crushing miscues, soaring daydreams. The piece begins with the exhilarated “She Smiled At Me — Twice!,” an exuberant celebration shouting joy to the whole world presented in alternating meter. But joy is stopped cold by to the dark blue “Oh, She Has a Boyfriend…,” in which the flutters of rapture turn to the buzzings of despair. But all is made right with the final movement, “She Loves Me!,” a rollicking jig happily interrupted by warm daydreams. Scored for piccolo, 4 flutes, alto, bass, and optional contrabass. Performance time: 6 to 7 minutes.